The Skylink SC-100 is a do-it-yourself friendly wireless security system designed for home users looking for a simple system to deter burglars. 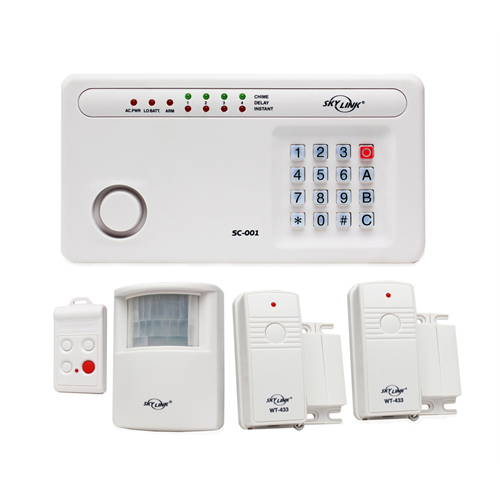 When the alarm is triggered it will sound a loud 110dB siren built in to the keypad, to scare away intruders. The starter kit includes 2 sensors for doors or windows, a motion sensor and a key chain remote for arming and disarming the system. The SC-100 main unit is powered by an included plug-in AC power supply with a 9V battery back-up in case of power failure. 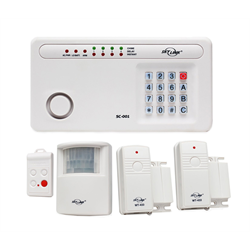 Additional remote keypads, additional sirens and additional wireless sensors can be added easily.